Cut onions into 2-inch pieces; cut pieces into thin strips. Cut bell peppers into thin strips. Cut carrots into julienne strips. Cook and drain noodles as directed on package. Toss noodles and oil in large bowl. Stir in onions, bell peppers and carrots. Mix remaining ingredients in wok or 12-inch skillet. Heat to boiling over medium heat, stirring occasionally. Add noodle mixture; toss with sauce. Heat through, stirring constantly. You can substitute sake or dry white wine for the sherry or water. 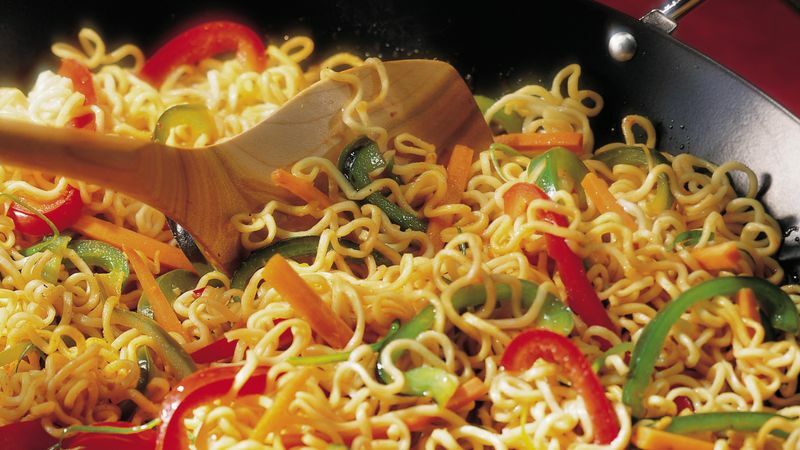 Variety is the spice of life, so jazz up these noodles with a variety of colored peppers, such as yellow, red and green, to make this dish more colorful.